We plant sod year round. 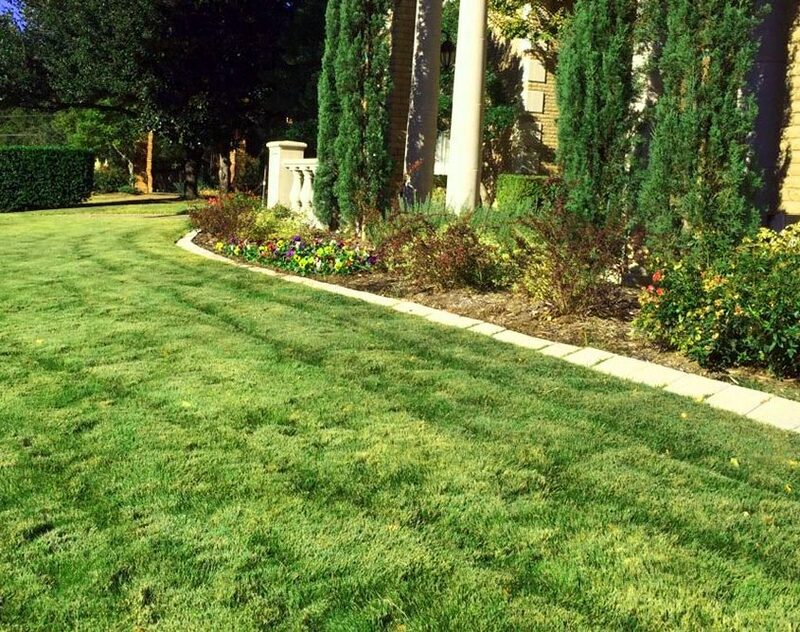 We use the highest quality grass from Brokers Quality Grass in Carrollton, which costs us a little more, but the pieces are solid, lush, weed free and insect free. Your grass is cut to order – this means if your sod installation is on a Monday, they will cut the grass Sunday night for delivery Monday morning. Your grass is never off the ground for more than about 15 hours. Yes, it’s okay to plant in the winter. The grass is brought in dormant and goes through zero shock. As Spring gradually arrives, the grass gradually takes root making for a smooth transition. 1. We sod cut the existing grasses and remove a thin layer of soil underneath. All soil and grasses are recycled at Soil Building Systems. 2. Once we’ve cleared the soil, we till the ground to a four inch depth. The North Texas soils compact overtime making it hard to root. By breaking up the ground we allow oxygen to reach the root systems quicker and enable healthier growth. No different than aerating your lawn. 3. On occasion, we amend the soil with added sandy loam. This is only if the grounds have low spots or if the ground is a true, hard clay. Typically, the native soil is ready for sod as long as it is properly worked and tilled. Bringing in a new, second soil or medium introduces a concept called “layering” that can sometimes confuse the root stimulation of plant material. 4. We lay the new sod in an offsetting pattern so that no two pieces are in line. The sod is then cut to fit around trees, landscapes, sidewalk and most importantly sprinkler heads. 5. We wet and roll and repeat. The grass is now near seamless and within two weeks’ time it will begin to take root. There are several breeds and varieties of grasses in North Texas. Below are six of the most common types of grasses that we plant. Zoysias: The most shade tolerant grass on the market – two hour minimum. They also thrive in full sun, particularly the Emerald. Zoysia is the more expensive breed on the market. This is because it takes longer to grow and must sit on the farms longer, but it is well worth the cost. St. Augustine: Enjoys the shade, but still needs three to four hours to thrive. Palmetto is the more shade tolerant of the two, and is the most sold patented grass in the world. Bermuda: Very sun tolerant, does not do well in the shade and requires less water than St. Augustine to survive the Texas heat. Celebration variety is the newest entrant on the market and provides a slightly greener blade that handles shade better than its counterpart.